MONCTON, NEW BRUNSWICK – (November 13, 2018): The Université de Moncton, in partnership with the Government of Canada, Genome Atlantic, Genome Canada, New Brunswick Innovation Foundation (NBIF) and Organigram Holdings Inc. (TSX VENTURE:OGI) (OTCQB:OGRMF), today announced the creation of an institutional research project focused on cannabis at the Université de Moncton. Supplying cannabis and cannabis products to a legalized adult use recreational market represents a major economic opportunity in New Brunswick and across the country. Indeed, the retail market value for recreational cannabis in Canada is expected to reach $8.7 billion annually. However, current production capacity will not meet the anticipated demand. To date, cannabis has not benefitted from the application of biotechnologies (particularly genomics) that have led to massive increases in yields and the sustainability of other agricultural production systems. The innovative, research-driven approach supported by this partnership will explore how these novel approaches can help improve the productivity and quality of cannabis products. Genome Atlantic was the catalyst for the project, to which the project partners will contribute more than $1.1 million over three years. The research will be led by Dr. David Joly and Dr. Martin Filion, both professors from the Department of Biology, Faculty of Science, Université de Moncton. Organigram will provide working space, raw material and expert resources in collaboration with the Université de Moncton research team. Genome Atlantic’s contribution is made through Genome Canada’s new Regional Priorities Partnership Program (RP3), which allocates funding for projects that reflect regional priorities. The expected results from this project are closely aligned with New Brunswick’s Economic Growth Plan and will contribute to an economically-viable cannabis industry by increasing production and potential revenue. This project also builds on commitments made by the Government of Canada and the four Atlantic provinces to drive economic growth in the region through the Atlantic Growth Strategy. This Strategy supports strategic investments in initiatives that build on Atlantic Canada’s competitive advantages, such as its growing innovation ecosystem and skilled workforce, and position the region to capitalize on emerging opportunities. Other benefits include training of highly qualified personnel required to support the growth of this industry; developing proprietary technologies that can be marketed to other jurisdictions; and enhancing New Brunswick’s and Atlantic Canada’s role as a world leader in cannabis science. “Cannabis holds tremendous potential for those parts of Canada and the world ready to take advantage of it. The NBIF is pleased to support a project that increases New Brunswick’s competitive advantage in this burgeoning sector by bringing together experts in industry and academia to use genomics in new ways that improve the quality of cannabis products.” – Dr. Laura Richard, Director of Research, New Brunswick Innovation Foundation. The Université de Moncton is Canada’s largest French-language university outside Quebec. Founded in 1963, it is an institution with three constituents (campuses) located in Edmundston, Moncton and Shippagan, in New Brunswick. It offers a range of programs in the three study cycles to meet the training needs of the popu­lation it serves. It provides its services to the vast Francophone diaspora throughout the country, thus becoming the ideal symbol of the linguistic and cultural vitality of Francophones living outside Quebec. Genome Atlantic is a not-for-profit corporation with a mission to help Atlantic Canada reap the economic and social benefits of genomics and other ‘omics technologies. Since its inception in 2000, the corporation has worked with a range of private and public-sector partners to enable more than $100 million in new genomics R&D. The Atlantic Canada Opportunities Agency works to create opportunities for economic growth in Atlantic Canada by helping small and medium-sized businesses become more innovative, productive and competitive, by working with diverse communities to develop and diversify local economies, and by championing the strengths of Atlantic Canada. Since its launch 15 years ago, the New Brunswick Innovation Foundation, an independent, non-profit corporation, has invested over $100 million in New Brunswick startups and researchers and leveraged $457 million more from other private and public sources. Those strategic investments have helped launch over 100 companies and funded nearly 500 applied research projects. Profits from NBIF’s investments go back into the foundation for reinvestment in other startups and research initiatives that drive innovation, attract investment and create jobs in New Brunswick. Find out more at nbif.ca. 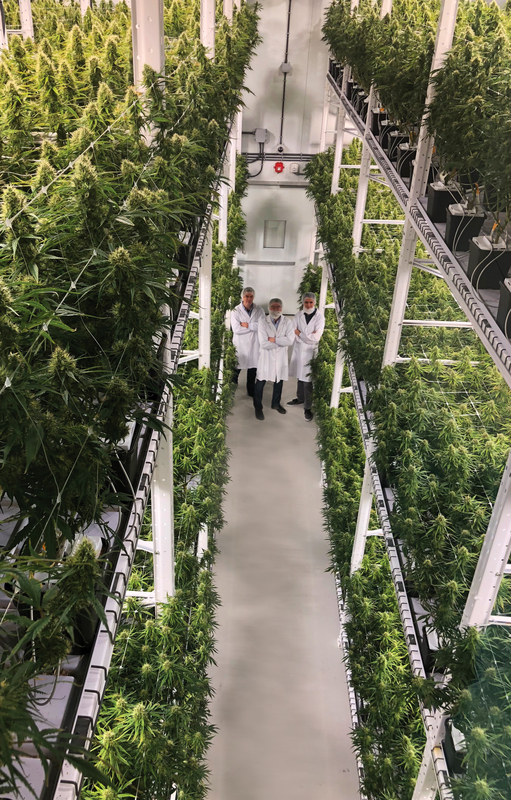 Organigram is focused on producing the highest-quality, indoor-grown cannabis for patients and adult recreational consumers in Canada, as well as developing international business partnerships to extend the company’s global footprint. In anticipation of the legal adult use recreational cannabis in Canada, Organigram has developed a portfolio of brands including The Edison Cannabis Company, Ankr Organics Trailer Park Buds and Trailblazer. Organigram’s primary facility is located in Moncton, New Brunswick and the Company is regulated by the Access to Cannabis for Medical Purposes Regulations (“ACMPR”).